To be honest, I've been pretty confused by the whole Death of Wolverine thing. Unlike the death's of Blue Beetle, Superman and Captain America, you can't pinpoint where the Canadian has bit the big one. It's happened across so many titles. I think even in hindsight, Marvel will say the death of arguably their biggest hero has been as messy and hairy as the mutant himself. Now instead of a tale of Kitty and Nightcrawler filling in Logan's outstanding debts, Marvel is launching weekly series Wolverines in January, focussing on X-23, Daken, Lady Deathstrike, Mystique and one of the best villains in comics; Sabretooth. As much as Secret Wars is a counter for DC's upcoming Crisis (how quiet have DC been at NYCC anyways? ), written by Charles Soule and Ray Fawkes, with art by Nick Bradshaw and others, Wolverines will take weekly series Batman: Eternal on claw to batarang. 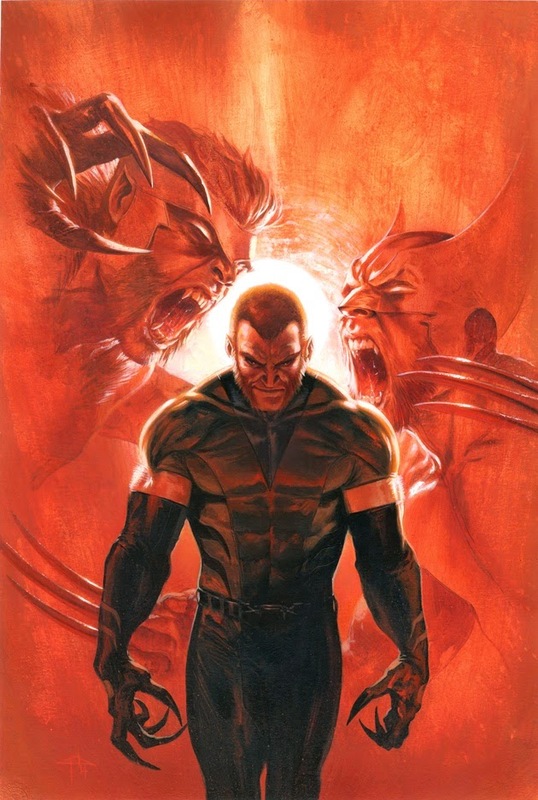 A weekly series is too big for my wallet to bite into, but hey, I really just wanted to post Gabriele Dell'Otto's Sabretooth cover up anyway. What can I say. The dude's guaranteed awesome and like I said, I have the hots for the tooth. Simple really.